Lucian, born in approximately 125 AD, was a prolific satirical author from the city of Samosata in the province of Syria, now Samsat in Turkey. He was, apparently, not a native speaker of Greek, and yet went on to become an instructor in rhetoric, with posts in Greece, Gaul and Rome, before finally becoming an administrator in Egypt during the reign of the Emperor Commodus and passing away some time after 180 AD. He composed more than seventy works, including many satirical dialogues, speeches and even a short novel. "The Dialogues of the Sea Gods" are a collection of brief dialogues between famous figures in Greek myth that all have something to do with the sea, including Poseidon, Triton, the Nereids, the Winds and even the Cyclops. While they are cleverly written and amusing in their own right, these fifteen dialogues also have much to show us about the works of mythology that were popular in the second century AD, contemporary views on the many inconsistencies in Greek myth and those parts of the world where, despite being outside what we would consider 'Greece' in modern terms, Greek culture flourished under Roman rule. 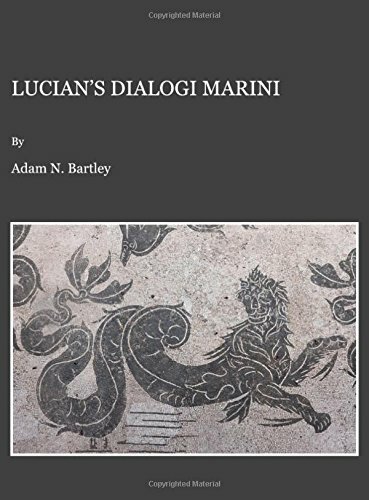 This volume considers the developments of literary Greek language, the relationship between Greek Drama, Epic and Bucolic poetry in Lucian's time, and the discussions of myth by philosophical and moralistic writers that Lucian both uses to critique myths and parodies in their own right. This has much to tell us about the works that survived into Lucian's time from the Classical period, including many that we now know only from fragmentary material, and their relative popularity. There is also detailed examination of the way that the interaction between Greek and non-Greek culture has influenced Lucian's depiction of 'Greek' myths. Dr Adam Bartley received his PhD in Greek and Latin Literature at the University of Sydney in 2001. He has conducted research the Georg-August Universitat, in Gottingen, Germany and the University College in Cork, Ireland. He is currently a Lecturer in the Department of Classical and Archaeological Studies at the University of Kent.